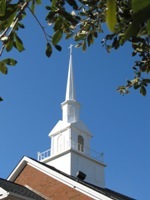 The first phase in the establishment of Shallotte Presbyterian Church was set in motion in late winter of 1963 or early spring of 1964. The originators of this movement were mostly Presbyterians actively involved in the worship and operation of Camp United Methodist Church in Shallotte, North Carolina. Also among those interested in this endeavor were some who had recently moved to the area due to retirement or business interests. The initial proposal and conversation with Mr. James Tubbs, Executive Secretary of Wilmington Presbytery, began the process of the formation of a mission Presbyterian Church. We have been steadily growing and reaching out to our community since those early days. In April 2009 we paid off the mortgage on our new sanctuary, years ahead of schedule. We are currently looking forward to celebrating our 50th Anniversary in 2016 and hopefully breaking ground on our new Columbarium and Memorial Garden. 11am Sunday Worship Services in our Sanctuary are traditional, warm and inviting. Please join us ANY Sunday to enjoy the beautiful sounds of the Shallotte Presbyterian Church Chancel Choir. The Christian Education program offers high quality studies for all ages. Sunday School Classes are held at 9:45am for both Adults and Children. A Nursery is also provided during our 8:30 and 11am Worship Services. An ecumenical Vacation Bible School is hosted each summer and has been well attended. It continues to have the support and input of the three area churches. Please check our website in the late spring and early summer months for information regarding times, volunteer opportunities, and registration.